There is much discussion about "The Jewish Vote" in the ongoing presidential race. While "Jews for George" made headlines during the 2004 campaign and more Jews than expected voted for McCain in 2008, in the 2012 election the political pundits are already predicting a large shift among Jewish voters, who historically have voted overwhelmingly Democrat. Aside from polling numbers, another way to determine how the Jewish vote is shaping up will be from yarmulke sales. In the past few presidential elections the nominees from both major parties have had their name and logo embroidered on suede yarmulkes (or kippahs) as one more way for supporters to promote their candidate. Already, yarmulkes featuring President Obama's re-election campaign logo are being offered for sale on the Web. The Obama Yarmulkes were famously known as "Obamulkes" when they first appeared in 2007. The ivory suede yarmulkes with the 2012 Obama re-election logo are available for pre-order online or in person at J. Levine Books & Judaica in NYC. Of course, it is being emphasized that these kippahs are made in the USA as it would be scandalous if they were made anywhere else. 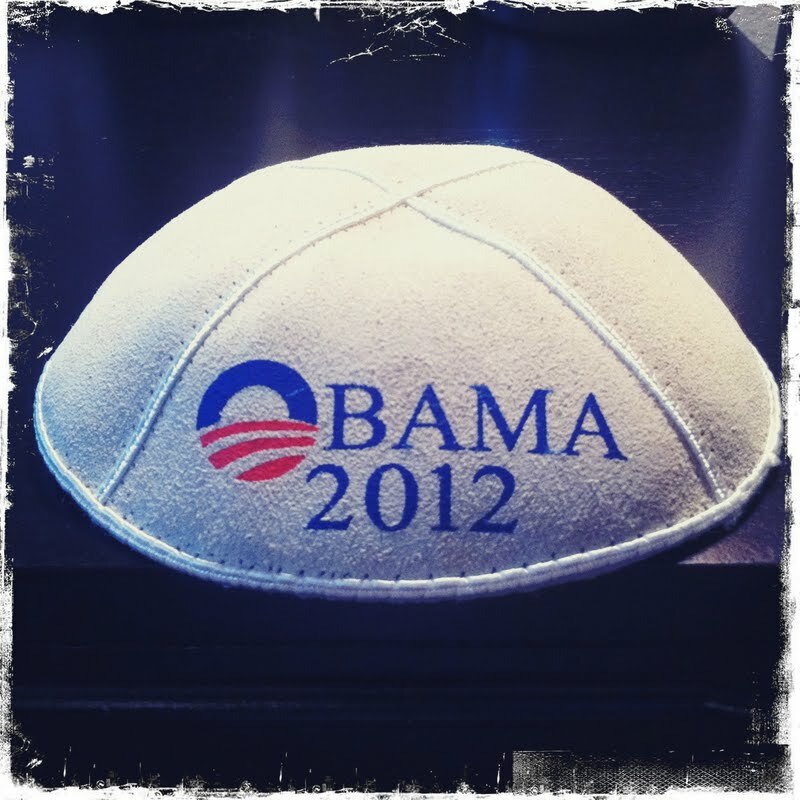 The yarmulkes are selling for $9 each at Obamulkes.com (with a $5 shipping charge). No doubt they'll be on the heads of many Obama supporters at the upcoming AIPAC Policy Conference at the Washington Convention Center in early March and on college campuses around the country. Matthew Walters, the creator of the Obamulkes, isn't naive. He knows that there will be many Jews who aren't fans of the president and won't like seeing the Obama re-election campaign logo featured on a Jewish religious item. But he offers a different perspective: "As a Jewish American who's also a vocal supporter of President Obama, I see the Obamulke yarmulke as a unique conversation starter. With so much at stake at the ballot box in 2012, there's a real value in wearing your politics on your sleeve -- or in this case, keppe (Yiddish for head)," he explains. During the 2008 campaign, more than 1,500 Obamulkes were delivered to Jewish supporters all around the country, but the most memorable recipient turned out to be Barack Obama himself. "In November 2007, then-candidate Barack Obama came to New York to give an historic speech at the Apollo Theater in Harlem," Walters remembers. "I had a chance to meet him, so I handed him one of our 2008 Obamulkes. He laughed and showed it to his Secret Service guys. I think he got a little kick out of it." With all due respect to our president whom I happen to still like and appreciate, I fully agree with Doug that this is a bad idea. A kippa shouldn't be used for political campaign purposes, it's in really bad taste. Nekudah. As for the Blue Kippa with a maize "M", I rather prefer the green one with a big white "S". I'm with you Alan. Go State!! !